Several years ago I surprised our granddaughter, Elena, with a couple of goldfish. She was two at the time and appropriately happy considering her age. Sophie, however, was convinced the goldfish were for her and was amused and intrigued. She was also determined - determined to figure out how she would catch them for lunch. She soon decided it wasn't worth the trouble. So what does Sophie have to do with all this, you ask. I'll get back to her later in this post. I've had this post bouncing around in my head for quite some time now. I think we all fall into the 'expectation' trap sometimes and when we do, the outcome is usually disappointing and discouraging. Let me give you some examples. You work especially hard on a project for work, give up your lunch or breaks, stay late and turn in something you're especially proud of. You're sure your boss will be thrilled and will give you a pat on the back and tell you how lucky he is you're on his team. Instead, he merely says, 'thanks' and moves on to his next business. Your wedding anniversary is approaching, maybe one of the early ones, and you imagine your spouse will be the Prince Charming you've always dreamed of. He'll shower you with flowers, independently make a reservation for a romantic dinner for two, maybe even buy a sappy card. He remembers it's the day but dinner plans might be at your regular dinner joint and flowers......well, maybe next year. Card? Who buys cards? It's your first Mother's Day and you've seen how clever your Facebook friends' kids are or how clever their spouses are, letting Mom sleep in, serving up breakfast in bed with dandelions picked fresh from the yard, handmade cards, at least a cup of coffee waiting for you.......yeah.....none of that in your house. It's just another day. Sometimes expectations involve smaller stuff.....you buy someone a gift you expect they'll love and when they open it, you can see they don't. You make a new recipe that looks and sounds amazing only yours looks nothing like the photo in the recipe and you're pretty sure it doesn't taste like it either. You put on a new outfit you're sure your husband will love but he doesn't even notice. Or maybe you buy your teenage grandkids some new clothes that seem trendy and cool and they hate them. You're on death's door with the flu and expect your husband and kids will feed you chicken soup and tuck you into bed and instead they go about their lives leaving you to die on the bathroom floor. You attend a shower or a wedding, bring an awesome, expensive gift and never receive a thank you note. Or you mail a gift to an out-of-town friend, neice or nephew and never even get a call or email, much less a thank you note saying the package was received. In every case, you are left disappointed and discouraged. Then there are these types of expectations.....sometimes the ones that do the most harm. How 'bout when we are really upset about something, distracted, sad, moody and no one notices or tries to help? We haven't told anyone what we're upset about, but we assume and expect they'll notice and inquire and try to help. How about when we need something - a helping hand, some advice, a side dish at a family gathering, a babysitter......we don't ask, but we expect people will just 'know' and be there with whatever it is we need. How 'bout when we enter into a relationship and have expectations of what that person will be to us? Maybe it's a friend and we hope they'll be available to do things with, maybe it's in-laws that we hope will become siblings to us, maybe it's a boss whom you hope will be more complimentary and appreciative. And perhaps the worst expectation of all.....when our expectations of a spouse, a child or a parent are so lofty, so idealistic, so unrealistic that there is no way that person will ever please us or be 'enough'. We go through life with expectations. Expectations we've come up with over the years of how we think things will be, how we think people will treat us, and how we WANT them to be. We assume these things, often without communicating our expectations to the people we place these expectations on and then the result? 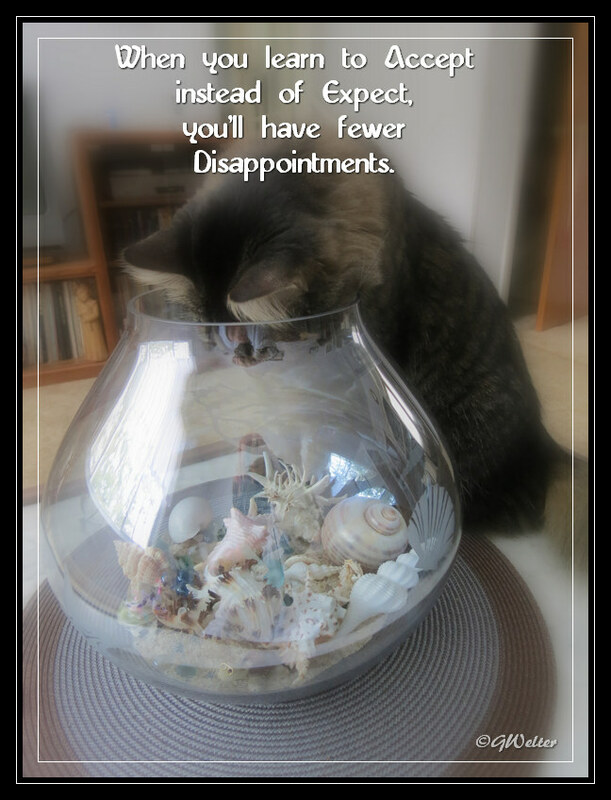 Disappointment.....because people and things, don't meet our expectations. Our spouse doesn't know what we want..........but we can't tell him/her because that would ruin the romance. Why can't we just ask for what we need so that the people around us can meet our expectations? Instead, we expect people to be mind readers and get upset when they are not. Why can't we just accept what we have without being disappointed that we didn't get what we expected? Why do we sabotage ourselves and then perpetuate the pain by placing the blame onto the people who didn't meet our expectations instead of recognizing that we are the one to blame for the disappointment. We are the source of our own disappointment. Don't blame people for disappointing you. Blame yourself for expecting too much from them. Expecting is always my favorite crime and disappointment is always my punishment. Disappointment is only for those who expect too much. Expectation is the noose they hang you with. Too many disappointments are usually a sign of too many expectations. Remember Sophie? Well, many months after the goldfish had entered goldfish heaven, I replaced the goldfish bowl on the coffee table with another glass bowl, only this one was filled with shells. At first Sophie was excited thinking entertainment had arrived. Her excitement was soon replaced with disappointment when upon inspection she found no water and no fish inside the bowl. Peace begins when expectation ends!